Sending a text-only version of your email is a great idea. You never know where and when your subscribers might be seeing your email. They may not always be able to read the HTML for various reason. 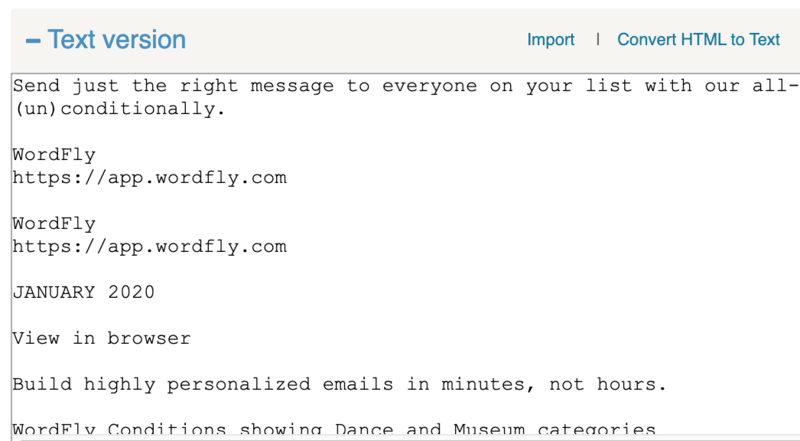 Fortunately WordFly makes it easy to quickly create a text-only version. Follow these instructions to convert your HTML email into a Text version easily. 1. Finish your Modern Editor email and click Exit to leave the editor. 2. Click the "Convert HTML to Text" link. 3. A version of your email will appear with the HTML stripped out, leaving just the text. You should make a few edits here and double-check that everything is correct. Any text from your HTML version wrapped in headline tags (<h1>, <h2>, <h3>, <h4> etc) will copy down in ALL-CAPS. This is by design. Double-check that you've included your unsubscribe link and organization name address. These elements are still required in the text version! You must Save your Text version it to save with the template.